We’ve been diligently working on potty training at our house, and some days are definitely better than others. So when we had a pretty good day yesterday I figured the tot and I could toss together a tasty treat as a reward for her hard work. 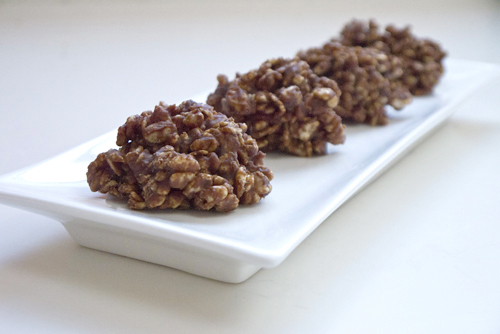 I made some no-bake cookies not so long ago and thought I’d do a little experiment. Instead of using oats, I wanted some snap-crackle-and pop. With a few simple ingredients and some adjustments on the original no-bake cookie recipe, we made something really yummy to reward us both. This is a great recipe to make with your kids – it’s so simple! Place the butter, peanut butter, milk, sugar, cocoa, and vanilla in a sauce pan and begin melting the ingredients together. While things are warming up, measure the puffed rice cereal and powdered sugar into a big bowl. Give things a good toss ensuring all those itty-bitty cereals are coated with a dusting of powdered sugar. Give the cocoa mixture a stir and continue to let things get happy over low heat. While you’re waiting for the butter to melt and come together with the rest of the stuff, cover two sheet pans with a couple of lengths of tinfoil for putting your scooped goodies. Now add a bit of heat to the cocoa coating and stir until things come to a low boil. Let the mixture simmer for about a minute and then take off the heat. Pour the hot cocoa goo over the puffed rice and stir until everything is coated. This part is best left to the adults because melted stuff is hot! Once things have cooled down for a minute or two, invite the kiddies to help scoop using a melon baller, spoon, or ice cream scoop onto the tin foil covered sheet pans. Keep scooping until there’s none left and then make some major room in the fridge for the treats to firm up. After a few hours of chilling, pop half of those treats into a zip top plastic bag and keep happy in the freezer. The other half can stay in the fridge, also in a zip top plastic bag, in easy reach for treat time. *Good luck eating only one. There is cocoa lisited in the ingredients.How much?